The woman is missing most of her teeth, but grins like a 6-year-old at a birthday party. 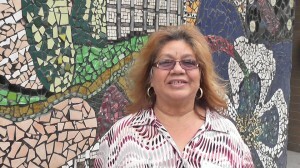 Unsteady on her feet, the 48-year-old homeless woman nonetheless proudly describes the meaning of the famous Emanuel Martinez mural outside Denvers La Alma Recreation Center. The young Chicano man is the future. The Indian is our past, says Gina Marie Crespin, who grew up in the Lincoln Park area and now spends her days in the neighborhood park. The eagle is power, Crespin says, pointing to the center of the mural where the soaring birds wings spread to form two female figures and a brilliant blue butterfly springs from its chest. That lady is the sun. The other is the moon. Crespin then points to the bottom of the mural and shivers. That skull, thats death. Its scary. The other side is a newborn baby. The dualities in the mural echo the opposing forces in this park, in this neighborhood and even in Crespin herself. On the one hand, shes poetic. On the other, she is broken. On the one hand, poverty and crime have shattered this area. On the other, a $125 million redevelopment here aptly named Mariposa butterfly in Spanish is becoming a model for Colorado and the nation on how to build a new kind of community for the most vulnerable people where health is the cornerstone for all decisions and all new designs. Asked about this effort, Crespin says she has one big health problem. Im an alcoholic. Im missing in action. Crespin is not alone in her struggles. By many measures, this neighborhood faces overwhelming challenges. Poverty rates in the Mariposa area are nearly triple the average in Denver: nearly 40 percent compared to about 14 percent across the city. More than half of children here are born to single, impoverished mothers. Graduation rates hover at just 12 percent and on standardized tests, the majority of students receive unsatisfactory scores. About 95 percent of students qualify for free and reduced-price lunches. Nearly half of residents are Latino, 41 percent are African immigrants or African-Americans, and almost all of the others are Anglo. Residents exercise during health class at the new Mariposa public housing development in Denver. Health problems are rampant. More than 55 percent of residents are overweight or obese. More than 38 percent report a health condition that prevents them from working, such as asthma, diabetes or heart problems. Three-quarters have high blood pressure. Few eat a healthy diet and only one-in-four residents exercise at least three times a week. Lincoln Park itself, which should be the jewel of the neighborhood with its colorful playground and mural, its own recreation center and a large outdoor pool, has been a liability more than a health magnet for some. More than half of neighborhood residents report feeling afraid of violence in the area. They say the park is often filled with drug users and homeless people. Still, Mariposa is tapping its rich history as a cradle for Latino power and Denvers civil rights movement, its enviable location close to downtown, bike paths and light rail and is recasting itself as a holistically sustainable, mixed-income, mixed-use transit-centered community. La alma means soul, said Denver Councilwoman Judy Montero, who represents this area and has fought hard to preserve its assets, like the recreation center, recently targeted for closure. Theres a real sense of community here.During the civil rights movement, this was ground zero for a lot of activism, and because of that activism, the neighborhood continued to thrive. This is a national project that people are watching now, Montero said. When the redevelopment is completed by 2018, the new buildings here will have naturally-lit central staircases and giant bike storage closets inside the units to inspire people 65 percent of whom dont have cars to continue walking, cycling or using public transportation. There is easy access to borrowed B-Cycle bikes and residents can get free passes for light rail. Art and pocket parks aim to boost mental health and offer safe spaces for both children and adults to exercise outdoors. Community gardens will allow residents many of whom are new immigrants from Africa to grow their own produce. Planners are trying to use trees, plants and traffic calming measures to make it easy and inviting to walk along a promenade from the light rail station at 10th and Osage to the neighborhoods art district on Santa Fe. School officials are hoping to establish walking school busses to help adults and children get exercise and walk safely to school. And, at the first completed building known as Tapiz at Mariposa, an ultra green 8-story public housing center with 100 units for elderly and disabled residents, people in the neighborhood gather regularly for classes on heart health and controlling diabetes. Next door is the Osage Caf, which is open to the public and boasts a state-of-the art kitchen and training academy for the Youth Culinary Academy. The center aims to train the next generation of chefs while teaching residents to cook healthier, less-expensive food from scratch. A collection of bright green Adirondack chairs have become a popular gathering spot next to the caf. Their location is quite deliberate. Developers wanted to attract people to sit outside here both to create a gathering spot and so residents could become new eyes on the street directly across from the neighborhood park. The ground floor of Tapiz also boasts a new community center with job training and health classes along with a permanent space for Arts Street, a nonprofit that serves young people in the area. 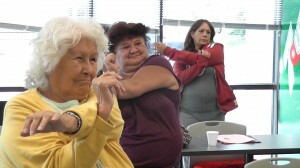 Residents stretch during a health class at the new Mariposa development. Altogether, Mariposa will replace about 270 low-slung townhomes built in the 1950s with about 800 new housing units and 70,000 square feet of new commercial, retail and community spaces. In 2009, when developers from the Denver Housing Authority worked with neighborhood partners, residents and consultants to dream up a new master plan for the Lincoln Park/La Alma neighborhood, they became one of the first 20 or so entities in the U.S. to conduct whats known as a Health Impact Assessment (HIA). Long popular in Europe but new to the U.S., HIAs aim to identify how a project or redevelopment will impact health. Erin Christensen, a consultant from Seattle for the sustainable design firm, Mithun, has worked on the redevelopment with Denver Housing Authority senior developer, Kimball Crangle. Christensen had heard about the concept of a health measurement tool and borrowed it from the San Francisco Department of Public Health, which had pioneered the idea. The Denver Housing Authority then became one of the first entities in the country to use the full-fledged health metric tool as the underpinning for an entire redevelopment project. Its fairly unusual to use the tool in such a comprehensive way, Christensen said. Denise Payne and Katrina Aguirre teach a class together on heart health. Says Aguirre: Just because were low-income doesnt mean we cant live healthy. Initially, developers used the HDMT to test various scenarios for how to rebuild the projects. They analyzed how competing designs would impact health and found, for instance, that many smaller green spaces would be healthier for residents than building one large open space. They also decided not to put exercise equipment in the new buildings, but rather to encourage people to support their existing community amenities and walk to the nearby recreation center. Its such a part of our thinking, said Crangle. Every decision we make is filtered through a lens of health and the built environment: where we put spaces, who we partner with. Crangle has leveraged funding from multiple sources including $22 million from the U.S. Department of Housing and Urban Development, a $10 million stimulus grant, EPA awards and state and city funds. The Colorado Health Foundation also awarded the Mariposa project $757,000 to implement the healthy development tool and use design to improve health. The area eventually will boast a greenhouse to provide a year-round gardening site, a walking path with art along the way and its own healthy living coordinator. A lot of times, health obstacles exist because people dont know how to get involved. By having this liaison, you remove huge barriers and help people take charge of their health, Crangle said. Both because of the areas ties to the Chicano mural movement and to the Santa Fe Arts District, Crangle and Christensen learned during more than 100 meetings with residents and partners that art was central to health in this neighborhood. Tonita Montoya, left, and Cheryl Jackson act out reactions to chest pain during a health class at Mariposa. Jackson, 53, had a real heart attack in August. I was at home by myself. I live alone and dont have a phone, Jackson said. She felt terrible, but couldnt get help until the next day. I lay on the couch and prayed and cried. I had no way to call nobody. Prior to this, I hadnt thought about the connection of health to things like social cohesion, culture and art. Access to arts and culture promotes mental health. Its fascinating to see that connection, Christensen said. Moving forward, the health tool will now guide a new effort called the Mariposa Healthy Living Initiative. It includes five campaigns: Get connected, healthy places, healthy eating, health care and wellness and lifelong learning. The new initiative includes a report card of indicators to track progress along with tool kit so other communities can incorporate health into future redevelopment projects. Our goal is to create a user-friendly implementation tool and guide that can be used by developers, designers and community service providers to easily incorporate health, Christensen said. In years past, developers rarely considered how designs would impact health. As a result, the U.S. created sprawling suburban neighborhoods where driving has been a necessity and the obesity epidemic has exploded. Improving health in public housing has become a hot topic in recent years, Christensen said. But, most efforts elsewhere in the country have narrowly focused on specific problems, such as better construction to prevent asthma or classes to improve heart health. In Colorado, only six Health Impact Assessments have been done to date. For DHA to complete one of the first 15 or 20 in the country was notable. But, then to take the next step of implementing the health tool marked a second groundbreaking achievement, experts say. Their commitment to asking the hard questions and potentially making changes to their plans if theyre not seeing the metrics change, thats what sets this apart from anything else Ive seen in the state of Colorado, said Jessica Osborne, one of two built environment coordinators for the Colorado Department of Public Health and Environment. History: Started in Europe in the 1980s. Only recently became popular in the U.S.
Denver Housing Authority: one of the first entities in the nation to use the tool for a comprehensive redevelopment project. Click here for more. Its serving a vulnerable population that has experienced a lot of disparities, said Gretchen Armijo, the other built environment coordinator for the state health department, who also teaches classes at the University of Colorado Denver on HIAs. She said the growing interest in health impacts is linked to the obesity epidemic. It has gotten our attention at a national level, at a state level, not just as a public health issue, but as an economic crisis. There seems to be an urgency to address this, Armijo said. This year, the first national conference on HIAs took place in Washington and just last week, Kaiser Permanente Colorado announced a $250,000 grant in concert with the Robert Wood Johnson Foundation and the Pew Charitable Trusts to support a new health impact project in Colorado. At Mariposa, health transformations are already under way. A former resident of the Lincoln Park projects, the mother of four now lives in Park Hill, has taken up bike riding, lost 100 pounds since last fall and teaches a weekly health class at Tapiz at Mariposa. I was living in poverty. I didnt have a lot. I decided I needed to do something with my life, said Payne, 29. Housing authority workers saw Paynes potential and tapped her for training to become a community health worker. She and fellow resident, Katrina Aguirre, traveled to St. Louis to be trained in a HUD health program called With Every Heartbeat is Life. The two now teach classes to Mariposa residents covering a range of topics from learning signs of a heart attack to cooking heart-healthy food on a budget. The teachers are first to admit that they are not perfect. While both are eating much healthier meals, both still smoke. Aguirre has a thing for Pepsi. Payne loves McDonalds. She just gave it up for good three weeks ago, but still craves her favorite menu items like the sausage biscuit. Her humility makes her an engaging teacher for the students, one of whom noted in his food diary that he ate corn flakes with Pepsi for breakfast. They dont have to listen to some doctor whos perfect, said Shaina Burkett, the housing authority worker who tapped Payne and Aguirre. I tell my students the real me so theyre not in it alone, Payne said. We encourage each other. Its mind over matter. Im here for a reason. Maybe I havent found that reason yet, but I need to be healthy enough to be here for that. I could be very important to someone I dont know yet. Aguirre is living in the Lincoln townhomes that havent been torn down yet. Her youngest child is 8 and the older two are teenagers. Until the redevelopment, she said she was sometimes afraid to let her children walk a block and a half without her to their dads house. People would make trouble, she said. The attitude among residents is changing. More people are not afraid. We want our neighborhood back. We cant let our children see this (chaos) every day of their lives, she said. More of the current residents are willing to learn about being healthy. This class is bringing in a whole new light to people here. Just because were low-income doesnt mean we cant live healthy. Im low-income. I have food stamps. I am still able to make healthy changes, Aguirre said. To entice the residents to take part in the class, DHA healthy living coordinator Elizabeth Rumbel brings healthy snacks and hands out donated prizes like King Soopers gift cards or tickets to museums at the end of each class. Residents who complete the full series of health classes receives a $150 payment. Incentives and free food work. Word of mouth works. Half of the people are in this class because a friend did it, Rumbel said. Having teachers like Aguirre and Payne also makes a big difference. Elva Chavez has lived in the Lincoln Park neighborhood for 25 years. She raised grandchildren, one of whom survived a stabbing in the area. Chavez has fought diabetes by attending regular health classes. She has lost 75 pounds and now lives in a one-bedroom apartment in the Tapiz building. She calls it her penthouse. They have the biggest sense of compassion. In addition to their knowledge, they care about the people who come to class. In addition to sharing her food cravings, Payne is open about violence she has experienced. That gives her common ground with many of the residents. I experienced domestic violence, she said. That was horrible. Im good now. Losing weight brought out a little more sunshine. I use that and try to give it to other people. Elva Chavez, 61, has lived in the Lincoln Park neighborhood for 25 years.She has raised several grandchildren, one of whom was stabbed during a street fight on July 4, 2003. He went out with a friend. I said, Dont go. It was a fight over a cigarette, Chavez recalled. Her grandson returned home pale and weak and slumped to her kitchen floor with a dagger still in his back. Since then, Ive had diabetes, she said, attributing her own health woes to the shock. Her grandson recovered, and little by little, Chavez thinks the neighborhood is also beginning to heal. Chavez has participated in many of the redevelopment meetings and was one of the first residents to live in the new Tapiz apartments. A survivor of child abuse and a recovering alcoholic who started drinking at age 8, she cant believe her good fortune to live in such a beautiful, safe building. She calls her small one-bedroom unit her penthouse. The windows face west over the rail yards with a view of the mountains beyond. The walls are filled with photos of her grandchildren. On the stove, she is cooking chicken soup, full of vegetables. A new healthy diet and long walks have helped her lose more than 75 pounds since she was first diagnosed with diabetes. Chavez takes advantage of weekly nutrition and diabetes classes that take place right in the lobby of her building and proudly has her diabetes under control. A new 8-story mural at the Mariposa development shows both an African and a Latino woman. On the outside of Chavez building, a giant new 5,000-square-foot tile mural fills an eight-story canvas.Titled La Alma de la Mariposa by Denver artist, Jeremy Ulibarri, the graffiti-inspired mural features a Latina woman and an African woman with a Somali head wrap. Together, the women symbolize the butterfly taking flight here at Mariposa, a rebirth intricately tied to health. Our hope is that this will be a neighborhood where people live who want a healthier lifestyle in green buildings. They will not be auto-dependent. They will want rich amenities at their fingertips and will be active and engaged in community events, said Crangle of DHA. They will want to be in a neighborhood that is culturally grounded with a strong sense of heritage.